Suzuki has confirmed that a living legend in its range – the Hayabusa – will be taken off the market at the end of December, almost exactly 20 years after it made its debut as the world’s fastest production bike. The bike, which is still largely similar to the original 1999 model despite a fairly hefty revamp in 2008, doesn’t meet the Euro4 emissions limits and other rules introduced as part of EU Regulation 168/2013. Those rules all came into force on 1st January 2016, but manufacturers were given a two year period of grace to sell remaining stocks of non-compliant models. That period ends on 31st December 2018, after which it will be illegal to sell the Hayabusa as a new bike in Europe. With much of the world, including Japan, adopting emissions rules that match Euro4 limits, the Hayabusa has been effectively driven into extinction. The model’s last significant holdout will be the American market, where it remains on sale next year, although with production in Japan having been discontinued the Hayabusa’s remaining lifespan in the States will be decided by stock levels. The Hayabusa was unveiled to the world in October 1998 amid wide expectation that it would be the first production bike to break the 200mph barrier straight out of the showrooms. Suzuki didn’t exactly play down the idea, either. Even the bike’s name, Hayabusa, is the Japanese term for the Peregrine Falcon; the world’s fastest animal, able to hit 200mph in a dive. In reality, the stock 1999 ’Busa ran out of puff just shy of that figure, but independent tests on standard bikes recorded as much as 194mph, making it by far the fastest production bike on the planet. The original model came with a claimed 173bhp from its 1299cc four-cylinder engine. It mightn’t seem a jaw-dropping amount now but at the time that was around 25bhp more than the most powerful existing bikes on the market. The engine was allied to a body that basked in its own ugliness – sculpted for speed, not beauty – and bolted to a chassis that owed more than a little to the same era’s RGV500 GP bike. Even today, two decades after that original Hayabusa appeared, few bikes can beat its top speed. Not so much because it’s technically hard – although it is – but because the Hayabusa itself brought about the famous ‘gentlemen’s agreement’ among Japanese bike firms to bring an end to the top speed wars. While the 194mph 1999 Busa easily outgunned period high-speed rivals like Honda’s Blackbird and Kawasaki’s ZZ-R1100, later that year a new challenger – the Kawasaki ZX-12R – came on the scene. Boasting even more power than the Busa, 178bhp, it was expected to go faster, surely topping the 200mph (320km/h) mark at last. But then came the backlash; mainstream newspapers picked up on the performance figures, leading to the inevitable scare stories and faux outrage. ‘How dare impoverished motorcyclists be able to buy bikes with supercar-beating performance for less than £10k?’ they asked, as if wealth alone was a qualification to handle fast vehicles. Before the ZX-12R even reached showrooms in 2000, the fears had reached fever pitch, bringing serious concerns that European authorities would impose draconian power limits on bikes. And so came about an unwritten agreement between the world’s bike firms; from then on, no production bike, however powerful, would exceed 300km/h, or 186mph. Regardless of how closely manufacturers followed the agreement, it was effective in defusing the war for the highest top speed. By ending the battle to go ever-faster, the ‘gentlemen’s agreement’ actually improved the bikes that came later. Forced to focus on more useful attributes like acceleration and handling, manufacturers soon started turning out astounding 1000cc superbikes that were a match for the Hayabusa and its ilk in a straight line, but dealt with corners rather better. With its raison d’etre removed just a year after it was launched, few would have imagined back in 2000 that the Hayabusa would still be alive and kicking in 2018, but a steady stream of the bikes have continued to find buyers looking for a high-speed sports tourer rather than an out-and-out racetrack refugee. The Hayabusa’s engine is the key to its longevity. Although there are plenty of smaller, 1000cc fours that will now match its peak power in standard form, an entire industry has sprung up to tune the big Suzuki. With the assistance of turbos, Busas making 500bhp and more have been built thanks to the essential strength of the base engine, and another sub-industry found its place bolting Hayabusa engines into cars. At the time of writing, just three weeks before the Hayabusa can no longer be sold as a new bike anywhere in Europe, stocks are dwindling to nearly nothing. 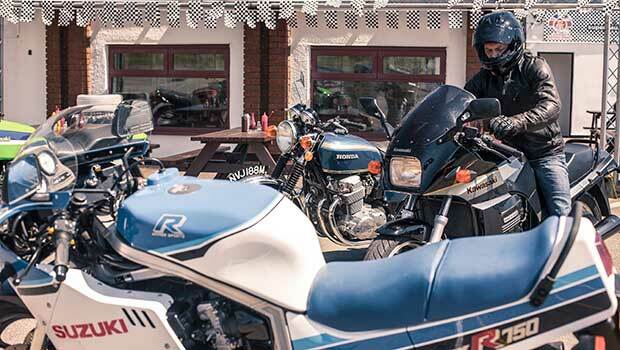 Suzuki GB could locate just two brand new, unregistered Hayabusas in its dealer network – one at Laguna Motorcycles in Maidstone, Kent, the other at John Groombridge Motorcycles in Heathfield, Sussex. So if you still want a factory-fresh one, act fast. With a list price of £11,599, before you even start haggling, the big Suzuki has become something of a performance bargain. If they’re not sold very soon, the remaining bikes will have to be pre-registered and sold as used models. However, while you won’t be able to buy a brand new Hayabusa in 2019, it’s not the end of the road for the famous name. Suzuki insiders say that a new Hayabusa is in the works, and it’s expected to debut within the next two years. We wrote about what’s in store for the next-generation Hayabusa back in January 2018 (here), and while it’s not going to be ready in time for the 2019 model range as was previously hoped, the other information we had remains accurate. Its shape is was previewed with the 2015 Concept GSX styling model, and the engine is set to grow to more than 1400cc to put it on a par with the 1441cc Kawasaki ZZ-R1400. When will we see the new bike? Suzuki is planning to launch at least 10 new models over the next three years, and the Hayabusa will surely be one of them, probably appearing sooner rather than later. The firm recently applied for new trademark rights on the Hayabusa name and logo, not only for motorcycles but also for clothing and merchandise, suggesting there will be a big marketing push around the new model. And as the newly-released Katana shows, Suzuki has no qualms about reviving its famous model names even when they’ve been buried for a while. Last year Suzuki sold around 130 Busas in the UK, and demand has remained at around the same level in 2018. Meanwhile its main rival, Kawasaki’s more up-to-date ZZ-R1400, has achieved nearer 400 sales per year in the same period. That’s a decent-sized field, and one that Kawasaki’s Euro4-compliant ZZ-R will have to itself in 2019. We wouldn’t bank on it having the same luxury in 2020. Suzuki Hayabusa revamp coming for 2019!